Has it been awhile since you've seen your pet? Although your cat, dog or rabbit could just be enjoying a little nap in a quiet corner of the house, lengthy disappearances may occasionally be a sign of an illness. Familiarizing yourself with some of the more subtle symptoms your pet displays when he or she is sick can help you ensure that your furry friend receives prompt veterinary treatment. They're Out to Get Me! Predators like to take the easy way out when they hunt for their next meals. After all, why spend all of your energy tracking and overpowering healthy prey when a sick or injured animal can't fight back? In the wild, ill animals instinctively avoid predators by finding concealed resting places. Although your sick or injured pet is in no danger in your home, his or her instincts trigger the immediate desire to locate a safe hiding place. Pets are often found under beds, at the back of closets or behind a stack of boxes in the garage when they don't feel well or are injured. Hiding is particularly common in cats, but can occur in any animal. Odd Postures. Is your pet hunched over or pressed tightly against the wall? Does he or she seem to favor a limb? Changes in your pet's normal posture may be a sign of an illness or injury. If you find your pet in an awkward position, it could be because lying down makes breathing difficult or places painful pressure on a sore or injury. Lack of Appetite. Just like people, pets lose interest in eating when they don't feel well. If your pet's food is untouched and the water dish is still full, an illness may be to blame. In some cases, your dog, cat or rabbit may avoid eating if it's too difficult to walk far or manage stairs due to arthritis, a joint problem or an injury. Unfortunately, your furry friend may quickly become weak or dehydrated without food and water. Difficulty Walking. If you manage to coax your pet out of a hiding place, does he or she have trouble walking? Illness, injury, arthritis, hip dysplasia, or a stroke or other neurological problem may cause your furry friend to walk unsteadily, favor a limb or drag his or her hind legs. No Interest in Going Outdoors or Using the Litter Box. Pets that stop eating will obviously need to eliminate much less often. Failure to eliminate can also occur if your pet has an intestinal or urinary blockage, both of which are potentially life-threatening conditions. If your pet hasn't urinated or defecated in a day, it's time to call the veterinarian. Accidents may also occur if your dog or cat has difficulty walking. Constant Purring. Cats don't just purr when they're happy, but may also make the sound when they're in pain. If your cat is in seclusion and spends a lot of time purring, an injury or illness may be the reason. Loud Tooth Grinding in Rabbits. Tooth grinding can be a sign that your rabbit is in pain. Irritability. Do you tend to become a little cranky when your joints ache or you don't feel well? Your pets may also become irritable or aggressive when they're sick or hurt. Vomiting or Diarrhea. It's not always easy to tell if your pet has diarrhea or is vomiting if he or she moves from hiding place to hiding place. Although you may not see any puddles the moment you walk into a room, your nose may tell you that something isn't quite right. If not, shine a flashlight in corners and under beds, making sure to avoid flashing the beam in your pet's eyes. Other Symptoms. Ill pets may cough, have runny eyes or noses, or sneeze. Other signs of illness may include pale gums, dilated eyes, disheveled coat, rapid breathing, fatigue and confusion. Your pet may voluntarily come out of hiding in a day or two if he or she only has a mild illness or injury. 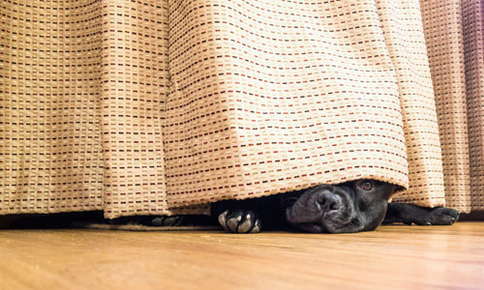 If your furry friend is still hiding after two days, we recommend scheduling an appointment with our office. We'll perform a thorough examination that will help us determine your pet's diagnosis and offer treatment options.